Terminating a metal oxide produces a layer of under coordinated surface atoms. In vacuum this undercoordination causes substantial surface relaxation: interatomic distances deviate significantly from their positions in the bulk crystal. For a given crystal face multiple distinct terminations – multiple parallel cuts through the crystal – are possible each of which may differ in surface energy. Adding water to an oxide surface generally leads to the dissociative adsorption of, at least part of, a first layer of water molecules and possible surface relaxation and reconstruction. Clearly the degree of surface atom under coordination must decrease after such a reaction with water but the thermodynamically favorable surface termination may also change as a function of water chemical potential requiring mass transfer of a layer(s) of metal atoms to or from the surface. Much insight into oxide surface chemistry would be gained if it were possible to follow the surface relaxation/reconstruction as a function of water chemical potential and pH1,2. Electron or x-ray diffraction based techniques sensitively probe interlayer spacings in oxides but spatially average in the plane of the surface and are insensitive to hydrogen3. The properties of lattice vibrations, phonons, sensitively reflect the interatomic potential, are sensitive to metal/hydrogen or oxygen hydrogen bonding, and thus should be a sensitive probe of surface relaxation/reconstruction. It is, however, challenging to distinguish the spectral response emanating from the small number of atoms near the surface from that of the much larger number in bulk. Because of the small mean free path of the electron, electron energy loss spectroscopy (EELS) can often provide such insight for oxide surfaces in vacuum4. However, because we ultimately wish to probe surface phonons as a function of water chemical potential EELS is not applicable. We overcome this problem by application of Vibrational Sum Frequency (VSF) spectroscopy. In a VSF measurement the output of pulsed infrared and visible layers are overlapped spatially and temporally at an interface and the emission at the sum of the frequencies of the incident fields monitored. This sum frequency emission is useful because it is interface specific by its symmetry selection rules and is a spectroscopy: as one tunes the frequency of the incident infrared infrared field to that of a vibration of a surface moiety emission increases >104 times. One consequence of the symmetry requirements is that a mode must be both infrared and Raman active to be VSF active. Here we describe the application of VSF spectroscopy to probe the surface phonon spectral response of the α-Al2O3(0001) surface with its vacuum termination and in equilibrium with water at circumneutral pH and at intermediate reconstructions. 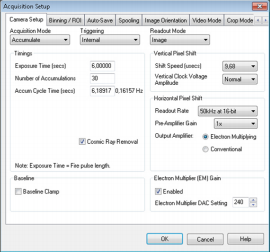 Figure 1: Screenshot showing parameters used for collection of VSF spectra shown below as set using Solis Software. Because the probability of emitting a sum frequency photon is ~10-7 that of linear light scattering, pulsed laser incident fields (with high peak power) and sensitive detection are required. For the former we employ a laser set up based around a commercially available Ti:Sapphire amplifier fully described by Tong and co-workers5. For the latter we employ a combination of a Shamrock SR-303i-B and Newton emCCD DU971P-BV (1600 x 400 pixels, back illuminated) operated at the parameters shown in Figure 1. Before entry to the spectrometer the emitted VSF light is focused in a plane parallel to the optical table. After dispersion the signal thus appears as a band in image mode. Binning each column over the height of the band gives a spectrum as a function of pixel number. Pixel number is then straightforwardly calibrated to frequency of the detected sum frequency light (see Figure 2), and, given knowledge of the spectrum of the visible field, frequency of the incident infrared. 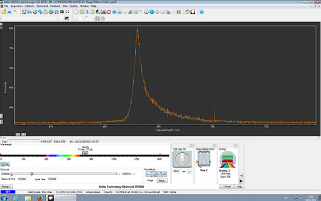 Figure 2: Screen shot of collected VSF spectrum in Solis. For a high signal reference sample (CO adsorbed on the Pt(100) surface The x-axis has been calibrated to sum frequency wavelength. 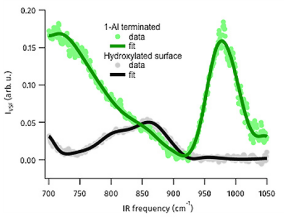 As shown in the Figure 3 we see clear spectral features in the 700 – 1000 cm-1 range for the hydroxylated α-Al2O3(0001) surface and UHV terminated surface (the spectrum of the hydroxylated surface is the result of interference between two modes with different azimuthal symmetries). A series of control experiments, for details see Tong and co-workers5, demonstrate that this signal does not result from surface contamination. The symmetry of the spectral response, with respect to polarization of the light fields and the angle of the crystal surface with respect to the plane of incidence demonstrate that both signals clearly result from surface phonon modes. Electronic structure calculations (detailed in Tong et al.5) show that for both surfaces the lower frequency modes are collective in origin and reflect surface relaxation over several interfacial layers. For the Al terminated surface the higher frequency peak reflects vibration of the surface Al atom while for the hydroxylated they reflect surface Al-O-H bending modes. Clearly, then, we can use our all-optical technique to extract surface phonon spectra under ambient conditions. Figure 4: VSF spectrum of the 1-Al terminated, hydroxylated and hydroxylated and then heated alumina basal plane. Clearly the moderately heated sample is intermediate between the two structural end members. In addition to these two end member surfaces we also examined a surface heated mildly in air. Based on prior work with other oxides, e.g. we expect such heating to lead to a surface dehydroxylation (n.b. we cannot recover the ideal vacuum stable termination without removing α-Al2O3: ion sputtering). We find, as expected, that the resulting surface phonon response is intermediate between the well defined structural end members reflecting the partial surface reconstruction (see Figure 4) and that its surface OH stretch response reflects the loss of some interfacial OH stretch groups. These results, in concert with additional details laid out in Tong et al.5, suggest that application of VSF spectroscopy to probe surface phonons of metal oxides should allow direct insight into oxide surface chemistry in a manner not otherwise experimentally available. Gabor A. Somorjai, Introduction to Surface Chemistry and Catalysis, John Wiley & Sons, Inc., New York, Chichester, Brisbane, Toronto, Singapore, 1994. 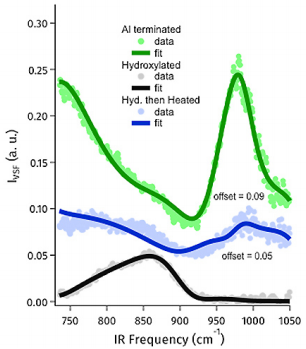 Peter J. Eng, Thomas P. Trainor, Gordon E. Brown Jr., Glenn A. Waychunas, Matthew Newville, Stephen R. Sutton, Mark L. Rivers, Structure of the Hydrated α-Al2O3(0001) Surface, Science, 288, 1029-1033, 2000. Martin Frank, Kai Wolter, Norbert Magg, Michael Heemeier, Ralf Kühnemuth, Marcus Bäumer, HansJoachim Freund, Phonons of clean and metalmodified oxide films: an infrared and HREELS study, Surface Science, 492, 270-284, 2001. Yujin Tong, Jonas Wirth, Harald Kirsch, Martin Wolf, Peter Saalfrank, R. Kramer Campen, Optically probing Al-O and O-H vibrations to characterize water adsorption and surface reconstruction on α-alumina: An experimental and theoretical study, The Journal of Chemical Physics, 142, 054704, 2015. Takahiro Kurita, Kazuyuki Uchida, Atsushi Oshiyama, Atomic and electronic structures of the α-Al2O3 surfaces, Physical Review B, 82, 155319, 2010. Jonas Wirth, Peter Saalfrank, The Chemistry of Water on α-Alumina: Kinetics and Nuclear Quantum Effects from First Principles, The Journal of Physical Chemistry C, 116, 26829-26840, 2012.